Comparing yourself and your children to others will make you discontent and make your family miserable. Enjoy your family as they are and never mind what others are doing. Don’t think about next week, next month, or next year. Try to enjoy the moments with your children right now. While living in the present, it’s important to have a vision as to what you want for your children. What is your parenting vision? Be specific… don’t just say, I want my kids to be happy. Decide what values you want to foster and what you would like to encourage. When you have a vision, it’s easier to discern how to handle different situations with your children. If you need help crafting your parenting vision, visit this post HERE (I even have a downloadable resource for you to use). For instance, if you want giving and compassionate children, then you may want to expose them to charitable causes at a young age. When your children mess up, forgive them (and let them know you forgive them). When you mess up, make sure to admit your errors and ask them for forgiveness. Parenting with guilt only leads to misery. Speaking of guilt, my next piece of advice…. Amen! We parents tend to lug around a suitcase of errors and wear chains of guilt around our necks. Treat each day as a new day and a fresh start. Do this for yourself and for your children. (A side note, I’m not talking Idina Menzel’s Let It Go… I’m speaking Luba’s Let It Go — because I’m an 80’s girl). When you’re in over your head and you don’t know what to do or how to handle things… ask for help. You’re not alone! Chances are hundreds of thousands of parents have felt what you’re feeling or have gone through something similar. Reach out and ask for help. Do not expect miniature, better, versions of yourself. Your children are individuals. Enjoy their uniqueness and celebrate their differences. I can’t tell you how much joy one can derive from play. If you feel like you don’t know how to play, then check out this article which I wrote a few years ago. It gives lots of pointers on how to play with your child. Don’t get lost in caring for your children and neglect yourself. You need to take care of yourself. I make sure that I take care of myself spiritually, physically, and mentally. Prayer, exercise, eating well, resting well, and thinking positively make a huge impact on my happiness, which in turn, makes me a happier parent. Are you struggling to come up with ways to de-stress? These 30 relaxation ideas for busy parents might be a good place to start. If you put a comedic spin on everything, you’ll be happier! Seek laughter and enjoy the funny things your kids do. What would you say contributes to being a happy parent? Truly amazing secrets. I like your #2 – be present. There is no way to be better and happier as a parent than to be a -present parent and not the absentee- parent. Yes… being present is so critical. God calls us to be present with Him. It only makes sense that we’re happier when we are present with our children. You said a mouthful here today (great advice) and I have to say I thank god every day I did learn early on to ask for help when I do feel I need it, because I think that does help so much. Thanks you so much for sharing!!! :) xoxo!! Asking for help is so important. It took me a while to learn that one (about 4 1/2 years into parenting). Glad you enjoyed this Janine. Thanks for sharing your thoughts too. That was a beautiful post! I have to admit that I don’t always ‘enjoy’ parenting and this is something I want to work on this year :) Being in the present…just accepting more. Thanks for sharing! I’m delighted you enjoyed this Rachael. Parenting is tough! I don’t enjoy every minute of it either– but I have learned and I’m still learning that I can still be happy even when I’m in the thick of it. I agree with you on so many of these! Especially, being present, each day is new and having a sense of humor. If I didn’t do that, I wouldn’t enjoy parenting at all! My hubby has a great sense of humour and I’m learned from him on how to spin something dreadful into hilarity. Thanks for sharing your thoughts on the secrets to being a happy parent Echo! I’m so glad you enjoyed this Lauren. I have to work daily to let go of guilt and past wrong-doings. Releasing it (letting go) leads to so much more happiness. Thanks for tweeting Lauren! These are such great insights. I love your points about comparing and being present, but what struck me most is the idea of forgiveness–asking and giving. That’s such a profound idea that never occured to me until now. It’s such a valuable aspect of life that I’d love to teach my daughter; and the first step is of course showing her through example. Thank you for sharing these! I’m so glad you enjoyed this Maria and that some of these resounded with you. It’s so important to teach our children forgiveness and one of the best ways is to role-model it ourselves. Thanks for sharing your thoughts on the secrets to being a happy parent. I appreciated hearing your perspective. All wonderful advice!! I love Anne of Green Gables too and have the DVD set – a gift from my husband. Have a blessed day! So glad you enjoyed this advice. I have the DVDs too. I can’t wait until my girls are a wee bit older… I’m excited to “introduce” them to Anne. Love the list, especially the last tip. I found that it helps to reduce stress and strife if I temper my discipline with humor and fun. “Get your coat on RIGHT NOW” is more fun when followed by “or else I’m going to tickle you!” Chase ensues…coat is thrown on haphazardly and child falls down and is now in the perfect position to put on shoes! Not the way it always goes…but those times are more fun than the times I’m just barking orders trying to get my girl to fall in line! Humour makes the world of difference doesn’t it? I find it’s awesome for stress relief. Thanks for sharing your thoughts on the secrets to being a happy parent. Jennifer this list is so on point! I’ve declared to just enjoy parenting this year and so worrying, obsessing and feeling guilty. Coincidentally today’s motivational post is about every day being a new day and i some about having that perspective in my parenting. Thanks for this! I’m so glad you enjoyed this Bijee and I just read your post… how awesome that you’re focusing on every day being new. Yes, you have a great sense of humour! Forgiveness is something I recently learned. It’s so important and I need to remind myself of it often. I’m so glad you enjoyed this. Thanks for sharing your thoughts on being a happy parent too. Wow Jennifer this is great! All of your suggestions really DO make for a happier parent! I am working on the getting more sleep, but the toddler doesn’t agree on that point…. Someday, right? I’m so glad you enjoyed this Jen. Getting more sleep definitely contributes to my level of happiness- that’s for sure. Praying you have a breakthrough on that point… soon! I’m so glad you enjoyed this Misty. Yes, I learned recently that I have got to start forgiving myself. I’m good with forgiving others but myself… eek, not so good. Fortunately God showed me how much happier I would be if I just let go of the guilt. Thanks for sharing your perspectives on this. This is such a great post – and I couldn’t agree more with just being present. It’s so funny that we both wrote about our parenting vision, because I’ve been practicing what I preached last week. I have a schedule, I’m giving myself permission to work out, and I’m spending more time with my kids. It’s amazing how easy this road trip my husband is on has been. I am sharing this because I love it! Being present makes a world of difference. I find I’m short-tempered, grumpy, and miserable when I’m distracted. However, when I’m in the moment, fully engaged, I’m content. I love what you shared about the direction your taking in 2015– good for you my friend! I think one of my favorite’s, “every day is a new day.” That relieves so of the burden we may try to carry into tomorrow. Yes, I love “every day is a new day”. It’s so liberating to think that way. Love this!! It’s so true that every day is a new day! So glad you enjoyed this Sarah. The tip of “every day being a new day” is one of my favourites. “Every day is a new day.” I absolutely love that Jennifer. And having a sense of humor. Sometimes you just have to laugh about things. And apologizing. Ok, I could go on and on. All really great tips Jennifer! I’m so glad you enjoyed this and that you could identify with these tips. Every day is a new day is probably one of my favourites. Mostly because it’s one that I embraced and committed to. I love that picture of us too. It’s one of my favourites! I’m so glad you enjoyed this and I loved hearing about how you play with your son. That’s awesome. Best wishes to you as you embark on this project/journey. Blessings to you my friend! Getting enough sleep =). I agree with you on all of these points!. I know my limit and have learned to ask for help when I feel overwhelmed. As a result, I am much happier. It took me a long time to learn how to ask for help… glad I finally learned that lesson though. This parenting gig goes a lot smoother when we have others to lean on. I love this so much!! I get so caught up in the the big picture TOO OFTEN that I forget to just live and enjoy the moment and where we are right now. Often the best moments are the ones that we fully engage in… not the ones that are distracted by expectations, or present, or past. I yearn to move closer to being in the moment every single moment of every single day. Thanks for sharing your thoughts on this Stephanie! Great advice! I agree with all of these. A great marriage, and fat bank account, and lots of sleep certainly make parenting easier, but I’m not sure those are the keys to happy parenting. Yes, there’s several factors that contribute to a happier parent. I’m glad you enjoyed this Lisa. Thanks for stopping by. I enjoy all of these, especially being present and engaged. I think that makes everyone in the family happier! I have a really hard time with taking care of myself though. There just never seems to be any time left. I was barely able to read this post today! I really like the idea of a parenting vision. This is something I’d like to create for this year. Being present and engaged is a daily practice… I need to remind myself of its importance, frequently! I think most parents neglect to take care of themselves (especially moms). It’s so important to do so though. We can’t give if we have nothing in us to give. Thanks for sharing Shilo. You always post such thoughtful and reflective comments. These are fantastic tips and as always, your blog just keeps getting prettier and prettier. Your posts are always so upbeat and helpful, they really are some of my favorites. I’m sorry it’s been so long since I’ve visited. I hope you and your family are enjoying the New Year so far! I’m glad you enjoyed these tips Brittany! My blog is getting prettier?! YAY! We’re having a good start to 2015 so far… thank you. I love the one about having a parenting vision. That’s not something I’ve really thought about before, but it makes total sense. You need to outline where you’re trying to go in order to succeed in getting there! I’m so glad you enjoyed this Katie! Yes, having a parenting vision is so important… it really lays the foundation for decision making and parenting techniques. I think “play” may be my favorite. I’m not a mother as yet, but I think of all things I love and cherish about mine is that although her work was serious, she found those random moments to just be a big kid with us. Great post! Play is a great tip to remember. I love how you appreciated that aspect of your relationship with your own mom. I mean, I do it, yes—but didn’t connect that being part of being a happy parent! You know what gets more parents I have seen than anything else…is your #1: Comparing. Nasty, nasty pit, that one…and it’s a bold faced lie too. It’s impossible to compare yourself to another parent! Different styles, goals, capacities, circumstances, personalities, personality combinations (kids and spouses), talents….the list is endless. It’s like comparing an apple to….Aunt Bertha (you know, the one with the 2″ mole on her upper lip with hair so long you could braid it). I’ll let you ladies decide which is which…but my point is, don’t compare. It’s a slippery slope with sharks swimming below (and Aunt Bertha, who misses you and wants that kiss). Oh yes… play is a huge happiness factor (and I’m not surprised that you engage in play all the time)! Comparing can be brutal in any aspect of life… not just in parenting. It’s a trap that we should avoid at all costs. Thanks for sharing your thoughts on what makes for a happy parent Jaime. I’m back! :) Those are all great tips Jennifer. I’m with you on being present. I can’t tell you how much time I’ve been there but not really been there if you know what I mean. With work and the blog taking up so much of my time I haven’t been the parent I would want to be. This year its going to be so different. I’m taking the blog in a new direction, transitioning out of the army so will have more time and will be spending it with the kids. I hope your 2015 has been great so far! Welcome back my dear! It’s so good to hear from you. I’m excited to be able to witness your blog’s direction in 2015– I’ll follow you anywhere my friend. I needed this today. I had such a rough morning arguing with Scarlet and then I had to drop her at school and I couldn’t stay because I had to take Des next. And she could totally see above all of it and say, “Love you, Mama. Bye!” So it made me happy that I’m raising a great kid. And of course now I’m sad because our argument was bad and she needed a tissue before I left and I didn’t have one! Sigh. I know we’ll have a sweet reunion this afternoon. Awww, I’m sorry to hear you had such a rough morning. Remember forgiveness… and savour that sweet reunion. Thanks for sharing Tamara– big hugs to you. Love these, Jennifer! My favorite being “have a parenting vision.” I couldn’t agree more and have often blogged about the topic, like you. I’m new here, but I’m going to poke around some more! I’m so glad you enjoyed this Erica and I’m delighted you stopped by! I loved your blog… it looks like we have similar thoughts on parenting. “Don’t compare!” Yup! That one right there! It’s so easy to do in this social media world! Sometimes I get so caught up in wanting to raise good kids that I forget they already are! Comparing is horrible and no good ever comes from it. I like how you shared about “good kids”. I’ve caught myself doing that too! Hi Jennifer, I love that quote from Anne Of Green Gables, it’s not a film I have ever watched….Maybe I should! Your post contains some great tips, I used to love playing with my two when they were small. We do still play games and do things together, but it’s not like when they were small and I never quite knew what was coming next. Looking after ourselves and trying to keep a positive outlook (although not always easy) are great nuggets of advice, which I do try to abide by. Oh my, you haven’t watched Anne of Green Gables?! You must, must, must! I think you would love it Deb! I’m glad you enjoyed this and thanks for sharing your perspective on being a happy parent. …It’s the ‘take care of yourself’ that I find easily gets lost in all the noise! Yes, taking care of yourself can easily be forgotten. I’m so delighted you enjoyed the parent vision post. Thanks so much for sharing your outlook on what it takes to be a happy parent. Good advice! Keeping these things in mind will help parents a great deal. I’m so glad you enjoyed this Donna. Thanks for stopping by. Yes, yes, and yes! I agree with every point. I think it is important to forgive yourself too. Parenting is hard and we all make mistakes. Focusing on the mistake rather than learning from it is not proactive. I have 4 kids (my oldest is 21) and I’ve stumbled a lot in raising them. I can say I am a much happier and better parent now than even 5 years ago. Your points are right on target. I’m so glad you enjoyed this Tammi. Forgiving ourselves is probably one of the hardest things to do but it’s so important in order to be happy! Great tips on how to be a happy parent. With my second generation of kids, my girls, I learned to be present, play, and to keep my sense of humor. I approached parenting with them in a completely different way than I did the first time and am much happier and less stressed this go around. Thanks for sharing. I’m so glad you enjoyed this Lysa. It sounds like you found comfort and confidence in your parenting. Good for you! I love this! Especially the bit about remembering that every day is a new day. I find that I often let myself get caught up in how I could have done this or that differently or focusing too much on some nebulous idea of “tomorrow”. Taking things day by day seems the much healthier choice! I’m so glad you enjoyed this. I love that quote from Anne of Green Gables– I remind myself of it frequently. “Every day is a new day with no mistakes in it.” This is such a great morning mantra… I need to post this quote on my desk! ALL of these 10 secrets to being a happy parent are DEAD ON! I was in a parenting funk for a LONG time, (almost all of my daughter’s life and she is 3). Only since having my son did I truly stop COMPARING myself to my sister-in-law and how the in-laws wanted me to parent my children. I feel like a whole new mother and I absolutely love my parenting style so I don’t know why I even compared in the first place! I absolutely LOVE embracing my children’s individual personalities. I have had to learn the lesson that my daughter is not going to love and do everything I want her to do. I am amazed at the activities and likes that my daughter is drawn to all by herself. When our similarities align (singing ALL.THE.TIME and dancing crazy), I embrace that as well! Thanks for sharing such a perfect article on happy parenting! I’m so glad you enjoyed this Monica. I was in the rut of comparing early on in my “parenting career”. I would say I stopped around the time that I had my second child too. I think you get so busy with two children there isn’t a moment to hesitate and look over your shoulder at someone else… that and you feel more comfortable in your role. Thanks for sharing your thoughts on this Monica. I appreciate hearing your perspective. This is great advice! I struggle most with the idea of each day being a new day, but it is so important and I’m trying! I’m so glad you enjoyed this. Just remember that Anne of Green Gables quote– recite it enough times and you’ll believe it. 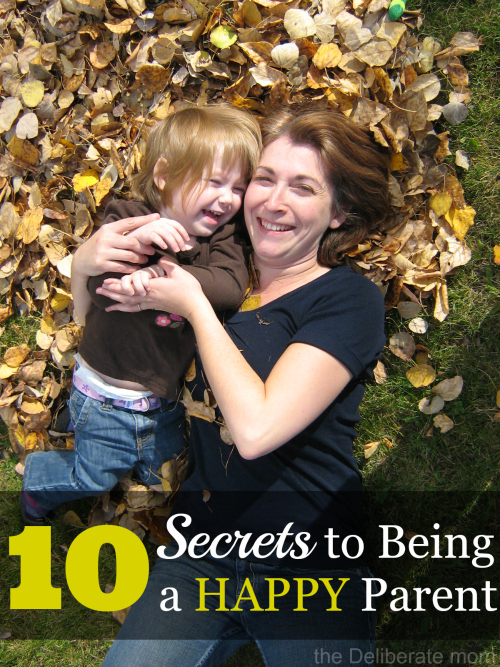 Thanks so much for sharing your thoughts on the 10 secrets to being a happy parent. You are SO right to not hold on to guilt… it’s so easy to make mistakes parenting, but its harder to remember that is all part of the process. :) Thank you for the reminder to take it one day at a time & move on from my mistakes. Holding on to guilt is so belittling to our self-confidence as parents. Thanks so much for stopping by Tiffany! Let them be themselves! Amazing. So simple in theory but something that always needs refocusing when it comes to putting it into practice. Why do we expect our kids to be BETTER little versions of ourselves? Great reminders! Reading your blog is helping me become a better parents! Thanks for your advice and ideas. I’m so glad you enjoyed this Stephanie and I’m so glad you found my tips encouraging. I think it’s easy to slip and forget that our children are indeed little individuals, whose personalities need nurturing rather than changing. While these tips are actually quite simple, it does take great intention to follow through. My best parenting tip is praying with and for our children. We can never underestimate the value of prayer. Thanks for sharing this encouraging list, Jennifer! Yes Heather! Thanks for sharing! As I indicated in my 9th point, prayer is a huge part of how I take care of myself (and my family). In those prayerful times, I’m definitely praying for my children (and praying for myself as a parent). There’s never a shortage of things to pray for, is there? I love all of these so much, especially living in the moment. I strive to do that everyday and I find I am more present when I do, when I think of being accountable to each moment I put my phone down more and play with my little one. Living in the moment is so important. I actually find I have less patience when I’m not in the moment. Comparing is a horrible trap and just leads to discontentment. Every day is a new day, amen to that! Love this one especially! It’s my favourite affirmation and I need to remind myself of it frequently. My husband & kids thrive on humor. When I remember to respond with humor, it not only helps us reach resolutions faster- but it fills their love tanks too. Milk spilled all over the kitchen… overflowing sinks… broken objects… making it into a joke helps us remain on the same side (instead of me vs. them), keeps them more receptive for correction for next time, and makes good memories too! Humor is big around here too. My hubby really taught me that. He can make a joke out of anything. Thanks for sharing your thoughts on the 10 Secrets to Being a Happy Parent Cassidy! I find being present is so important. When we’re reflecting on the past or looking into the future, we lose sight of contentment and enjoying what is. Thanks for sharing your thoughts on this Topaz. Thank you so much for featuring my post! I am so flattered! I’ll have to remember to pop by your party tomorrow. Thanks again! Jennifer, these are so true and so applicable. The ones I have to work on are “be present” and “take care of yourself”. In the midst of all the “things to do” and goals I am working on, I sometimes get a little lost. Glad I found you today. I’m so delighted you enjoyed this Elizabeth. We all have aspects that we need to “work on” as parents. It’s awesome that you know which you need to concentrate on the most! Fantastic Post! I would love it if you joined and contribute your awesome posts at my link party at City of Creative Dreams, starts on Fridays at 9AM eastern time :D Hope to see you there at City of Creative Dreams Link Party. I’m so glad you enjoyed this Shanice! I did stop by your party and shared it. Thank you for the invite. Great post and yes, I agree to all and especially ‘taking care of yourself’ is it:) Thanks for sharing. I’m so glad you enjoyed this Ping. Yes, taking care of yourself is so important and often the most neglected point! I’m so excited Tina! I can’t wait to see what you say about my blog. Thank you so much for the opportunity. Thank you for the awesome advice! I think all mothers could benefit from reading this article. I found you on IBA, congrats on the feature! I’m so glad you enjoyed this Nicole and I really appreciate you stopping by! Thank you for the kind and encouraging words. You’re amazing and your blog is looking fabulous! I just had to stop by after noticing your feature over at the IBA. Sorry it’s been a while since I stopped by, things have been super crazy here! Do you have a new theme? When did you make the change? Thanks Brittany! I was delighted about the feature! I’ve actually had this theme since June but I keep on tweaking, adding, taking away things. My title used to be pink and I decided to change it to black and I changed the fonts and font colours because the previous ones were kind of hard on the eyes. I added a great author box as well as a subscriber box and the follow bar that Tina mentioned. I made a lot of my changes at the end of December. I’m happy with the way things are looking though. Thanks for noticing! Thanks Jennifer – I need daily reminders! LOL! I named my blog Restoration of Joy because I had lost all joy, and it was evident in my parenting and also in my worshipping. Carrying those bags of guilt and shame with me daily was taking its toll. And then I realized, God’s forgiven me, so why can’t I forgive myself??? Ladies, NOTHING will ever be perfect. We’ll forget our poncho and it will rain. Your 11-year-old will go to school with unmatched socks because you didn’t inspire her enough to want to clean her room. Your 12-year-old will yell at you about making her play the flute because she doesn’t have the drive and fastidiousness to finish what she started. It’s all our fault, right? Thanks again, Jennifer. So blessed to read your blog and get to “know” you! Thank you for sharing those thought-provoking words Rachelle. Forgiveness is so important. I especially love that you pointed out that children are not miniature versions of you. I can’t tell you how often I’ve seen parents disappointed and children damaged because they didn’t “live up to expectations.” I think that is the joy of parenting–discovering who your children are and nurturing them to be their best version, not your best version. Such a good post and great reminders. Thanks for sharing!!! I’m delighted you enjoyed this Miranda! Yes, there is such joy in seeing our children develop into who they are meant to be. That’s truly beautiful. I loved the ” Every day is a new day” That’s the beauty of motherhood. Enjoy each day because kids are growing and they may not be with you like this after a few years. Yes! It’s one of my favourite reminders and it releases such joy to not be chained to the previous day but to have a fresh start each day. 10 sounds like an easy number. I start each day with these reminders, but as the day rolls on I seem to forget some, but then I can be reminded by a laugh or giggle.